The easiest way to sprout seeds indoors is to place them on a moist paper towel. Then put the paper towel and seeds in a very shallow tray or dish; keep it moist (a plastic bag would be handy to maintain moisture) and in a warm place in the house. Check daily; when you see roots, its time to plant. Rather than handling the seed at this point, carefully cut the paper towel into little squares, and lift each one out with a knife. Now you're ready to take it outside, plant it in your SFG filled with Mel's Mix, cover it, and give it a drink of water. You've just given your plant a head start—in about half the time. Instead of fourteen days, you may see a sprout coming up in just six. Now its time to decide whether you want to grow your own transplants indoors rather than direct seeding out-of-doors. To raise your own seedlings, you need a little bit of paraphernalia: Mel's Mix, a few cups and saucers, four-packs, and trays. 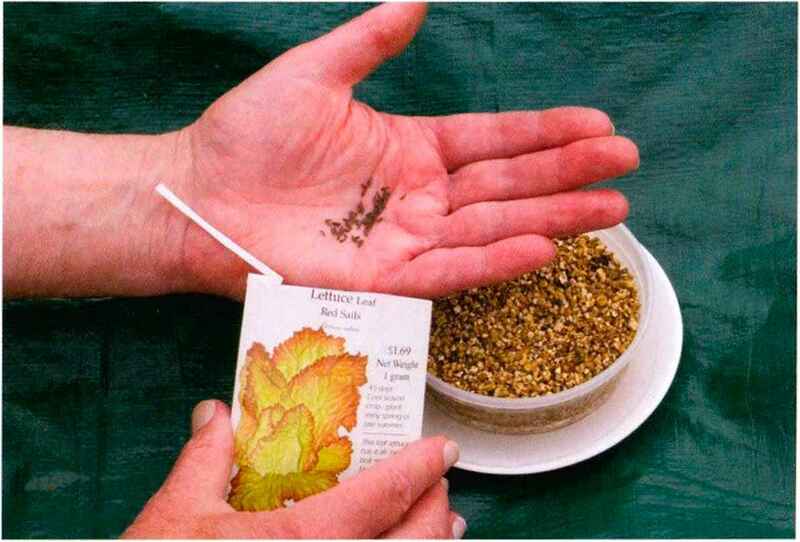 Start your seeds in a little cup of vermiculite and transplant them into four-packs filled with Mels Mix after they begin growing. When you're sprouting seeds in a cup of vermiculite, I suggest you transplant them into the four-pack as soon as the tops have sprouted and you see the first two leaves called the seed leaves. Most garden experts say to wait until you have two Utrue" leaves, but I have found that if you wait until the set of true leaves develops, the roots have already grown so long and tangled that it's almost too late to transplant. The seed leaf comes first, and its usually a fairly flat, large leaf that doesn't look like the plants regular leaves. The first set of "true" leaves comes out next as the stem grows higher. 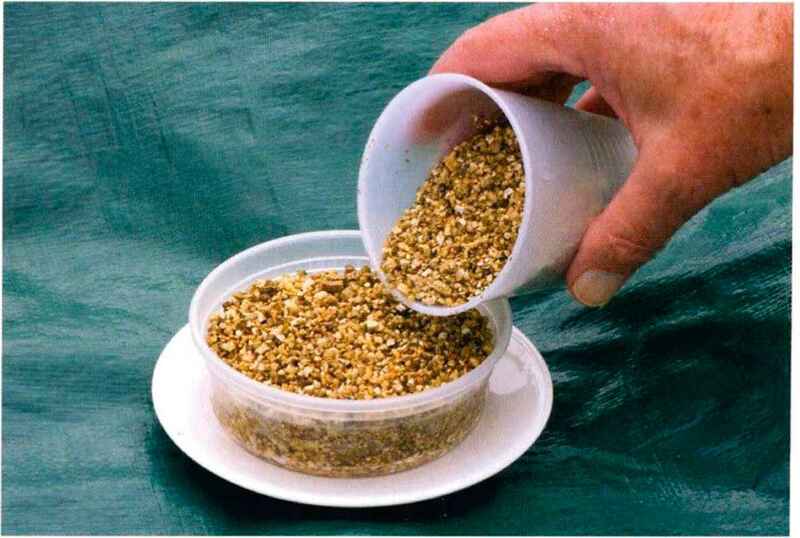 To start seeds for growing your own seedlings, poke some holes into the bottom of a container. (This is a leftover plastic container shown in the photo.) 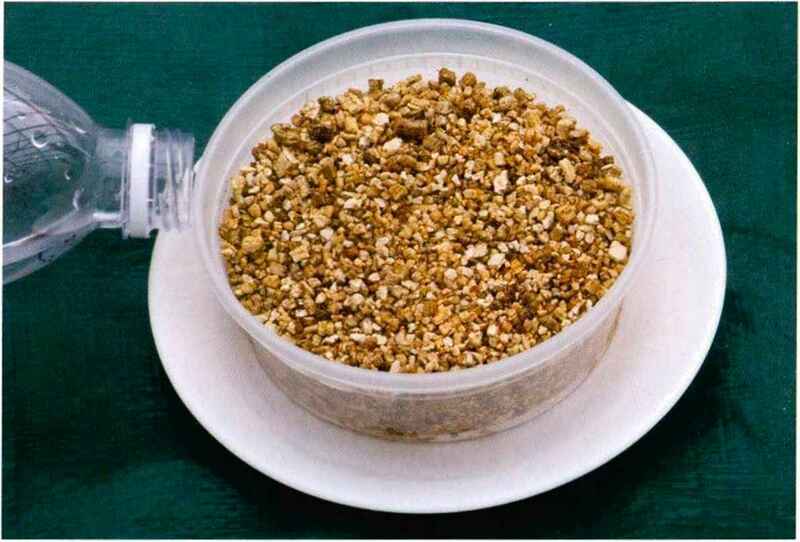 Fill the container with vermiculite and pour water around the rim of the plate. Add enough water until you notice a very slight color change to the vermiculite (it becomes darker). Pour a few seeds into the palm of your hand. 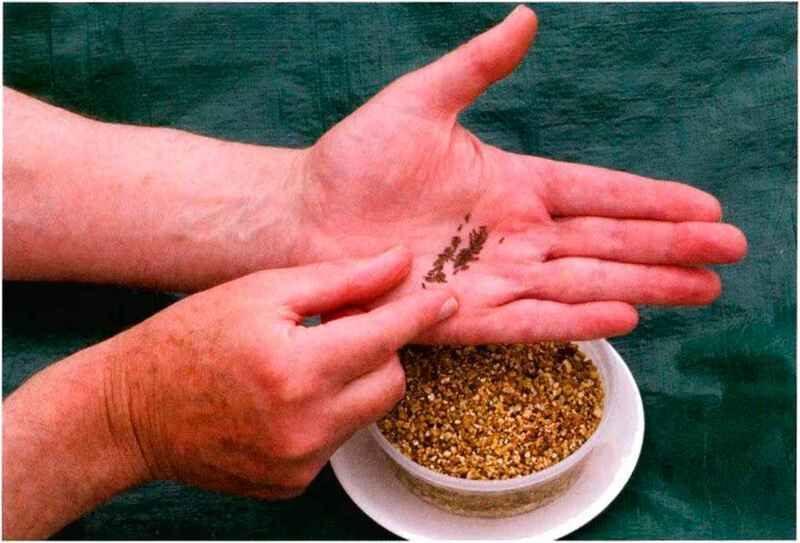 Pinch a few seeds with your thumb and forefinger. 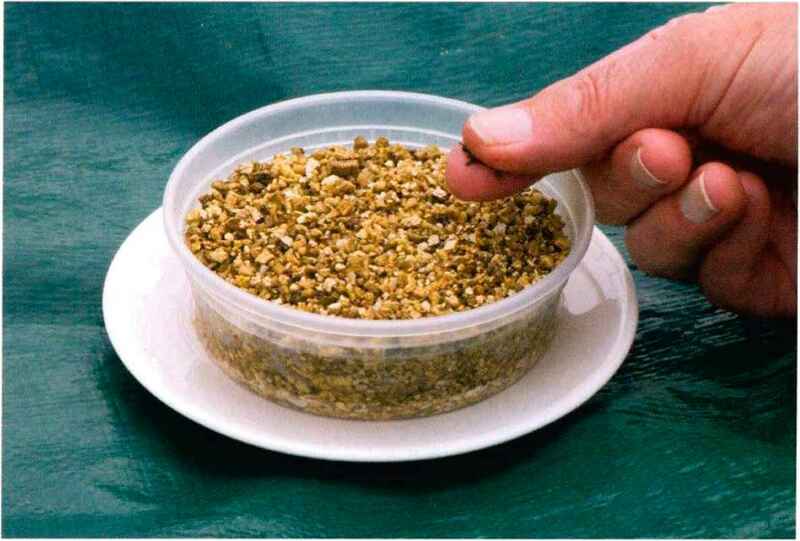 Sprinkle the seeds across the surface of the vermiculite. Cover the seeds with a thin layer of vermiculite (unless they need light to germinate; check the seed package). root you cut off, two new roots will sprout as it branches out, creating a much stronger plant. Next, take your pencil and make a hole in one cell of your four-pack, or outdoors in your garden soil. Then lower the plant root down into the hole. Make sure the holes big enough to hold the whole root. Take the point of the pencil and push the Mels Mix around the plant. Plant it a little lower than when it sprouted. Give it some water, either from above for outdoors or from below for indoors in four-packs, and then give it shade immediately. Sun will kill that young seedling. In fact, if youVe outdoors, always work in your own shadow, then make sure the plant has shade for at least a couple of days. 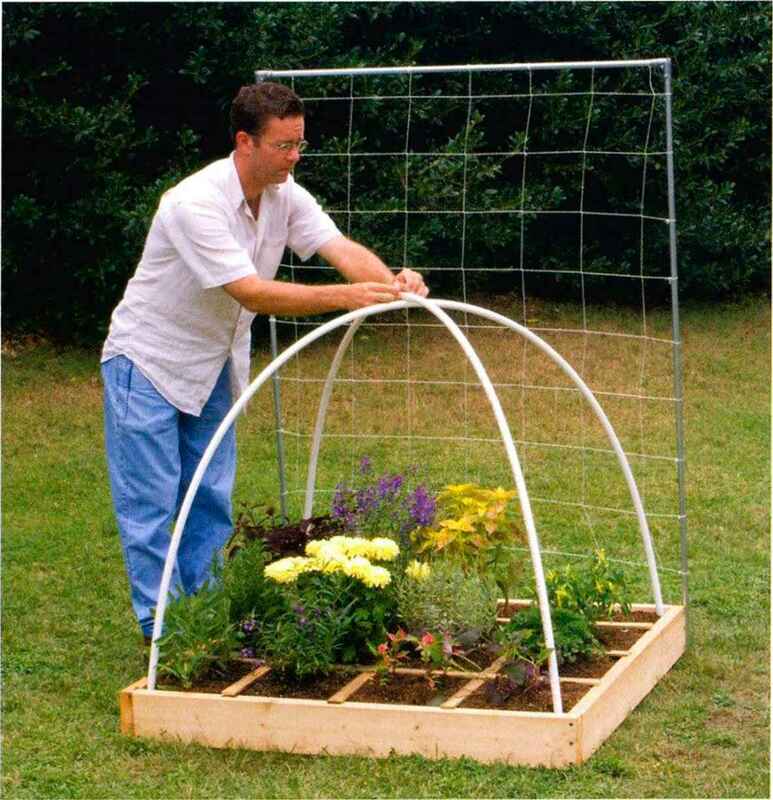 (Refer to Chapter 4 for information about how to build shade boxes.) Then you can let it have brighter light and then finally full sunlight. Now that plant will take off! When you place transplants into the garden, take a look at the roots to see if they are rootbound, in other words, if they've grown in a circle. My solution for a rootbound plant is to take that same pair of scissors and just cut off the bottom roots. Yes, the whole thing—the mass of roots and the soil. Then all the ends of the roots, wherever they are, will branch and send out little feeder roots. 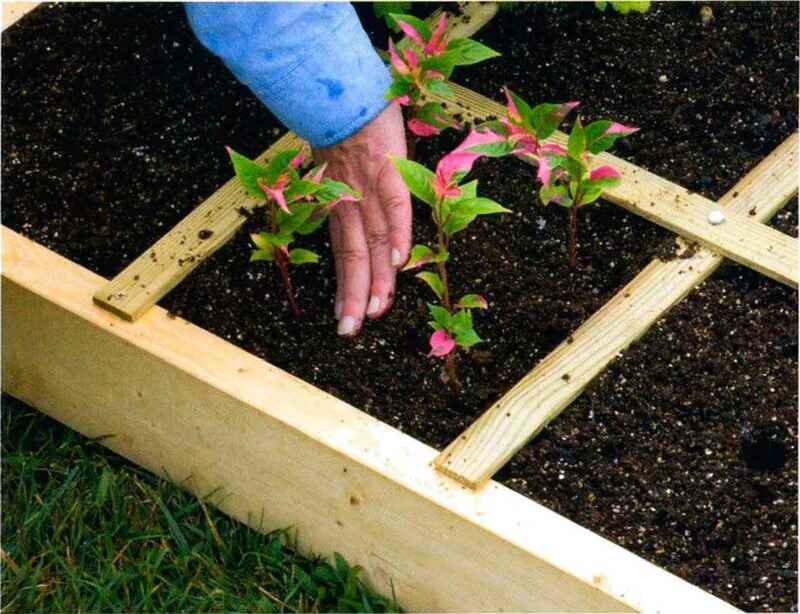 Lower the whole plant into the hole at the proper spacing in your outdoor garden. You can trim excess roots by snipping them with your garden shears. 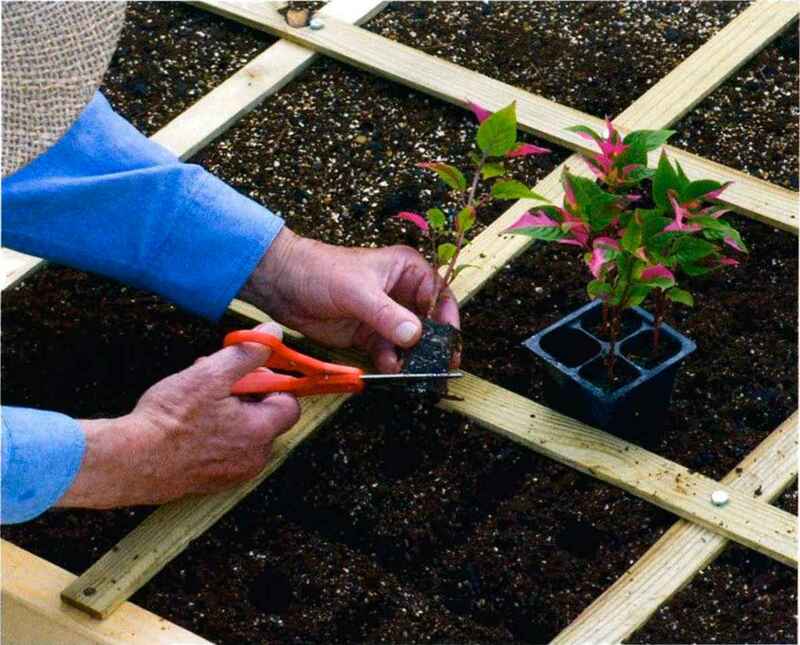 Push the mix around seedlings to form a slight saucer shape in the mix. Because of the saucer shape, water is directed straight down to the roots. 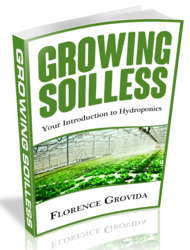 What develops in the sprouting seed in the lower stem and roots?